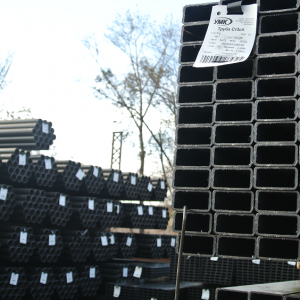 ﻿ Лента стальная (штрипс) | ООО "УМК"
One of the most popular products in the catalog UMC LLC is a steel strip, produced as a result of the splitting of hot rolled, cold rolled and galvanized coils. 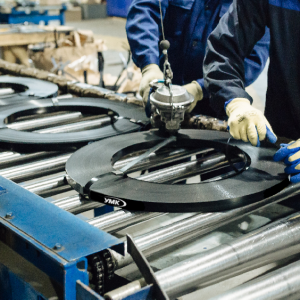 Production of the steel strip is carried out of rolled flat products of leading Russian manufacturers. 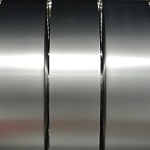 The quality of the steel used for production of steel strips meets all the production standards. Dimensions: UMC LLC produces galvanized steel strips of following sizes: Thickness – 0.25 … 2.0 mm. Width – 9 … 1500 mm. Weight – up to 5 tons. Normative documents: Steel strip is produced of steel coils in accordance with GOST 14918-80, GOST R 52246-2004 and GOST 3559-75 standards. 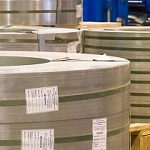 Material: CR steel coils. 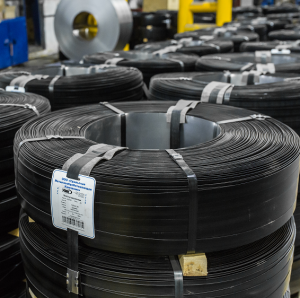 Dimensions: UMC LLC produces CR steel strips of following sizes: Thickness – 0.25 … 3.0 mm. Width – 9 … 1550 mm. Weight – up to 15 tons. 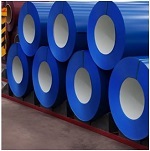 Normative documents: Steel cold-rolled strip is produced of steel coils in accordance with GOST 503-81, GOST 2283-79, GOST 19851-74, GOST 16523-97 and GOST 9045-93 standards. Thickness – 1,2 … 3,0 mm. Width – 9 … 1500 mm. Weight – up to 15 tons. 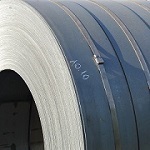 Normative documents: Steel hot-rolled strip is produced of steel coils in accordance with GOST 17066-94, GOST 17066-94, GOST 6009-74 standards and TU 14-1-3579-83 standards. Material: Color-coated CR steel coils and CR galvanized steel coils. Dimensions: UMC LLC produces color coated steel strips of following sizes: Thickness – 0,25 … 3,0 mm. Width – 9 … 1500 mm. Weight – up to 15 tons. Normative documents: Color-coated steel strip is produced of cold-rolled and galvanized steel coils in accordance with GOST 52146-2003 standards. 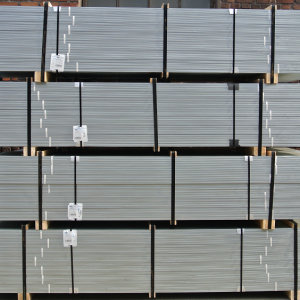 CR steel strip and galvanized steel strip. Thickness – 0,25 … 1,3 mm. 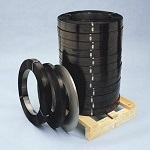 Width – 12,7 … 50 mm. Packaging steel strap is produced uncoated, galvanized and painted in accordance with GOST 3560-73, DIN EN 13246:2001, DIN EN 13247:2001 standards and TU 123111–011–94835001–2013 standards.